I've been off for a week ... and it feels GREAT!!! Haven't posted in a bit, but I've been busy with the family - and I wouldn't trade those moments for anything! We've also been keeping busy with soccer. My husband and I are coaching my oldest daughter's soccer team this year - we had 3 games last week (won all 3!!!) and have a tournament coming up this weekend. I hope you've been joining us for our Daily 5 / CAFE book study over at We Read, We Blog, We Teach. We have two chapters posted so far, and in addition to the fantastic posts, the amount of ideas and suggestions in the comments section is mind-blowing!!! I've had to start a notebook to record some of these fantastic ideas. I can't wait to start planning on what this is all going to look like in my classroom. And if one book study wasn't enough, I jumped into another. My good friend, Kim, has the most amazing posts about the Guided Math book over at Finding Joy in Sixth Grade. You can read more about the book study and organization at her link. All I can say for now is ... guess what book I got in the mail yesterday??? I've also been hard at work on my Interactive Math Journal resource. I'm also done all of the introduction and assessment stuff, and am just about to start on the entries and templates. It's keeping me quite busy. For a little break, I decided to work on a Parts of Speech product using my Crystal Ball Template. I just posted it last night. 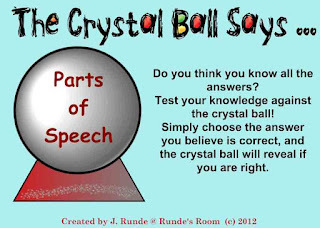 This is a SMARTboard file with 20 multiple choice questions for the 8 parts of speech - when an answer is pressed, the page links to a page where it is "magically" revealed on the crystal ball whether the answer is correct or incorrect. You can take a peek and download the preview by clicking on the picture below. Well, that's about it ... just a quick update for now. I still plan on doing my FAQ post for my math journals ... just let me get through the soccer tournament this weekend. Whew!!! I'm going to need a holiday from my holidays!!! Your girls are beautiful! Love their shirts and braids. Looks like you had a nice holiday. I am also enjoying the Daily 5 book study. So many great thoughts! Thank-you so much! Isn't the book study fantastic?!? My mind is swimming with ideas! Thanks, Mary! I'm not sure chasing the girls around the cottage is a rest, though. However, all three will be in summer camps in a week (for a week) ... looking forward to a rest then! I am so excited for your interactive Math Journal. I am going to be using it next year. I have already started my binders for each strand and am going to work on the lessons and templates. I start teaching summer school on Monday, but I am hoping I can still work on it during that time. Loving the book study. I am wondering how the guided math works with the 3-part math problem that is the focus at our school. Thank-you so much, Ilana. We do the three-part math, too - so I'll be trying to work the guided math into it. Do you have to do three-part lessons all the time? Last year we were only required to do one a week - I think it's changing to two for next year. I would also like to build in a full class of math centres once a week ... I still have to wrap my mind around how all this is going to work. Good thing I've got all summer to figure it out! I have found the three part math lesson hard because my students had difficulty making connections between the work we did in congress and the application to other questions. This is where note booking will be great. I will be working on it this summer as I set up my binders...oh, and when I am not teaching summer school. And teachers don't work during the summer. I just bought these great wind chimes to use as my signal in language.